These Reese’s Cookies with Chocolate Chips and Oatmeal are (almost) too easy to whip up. They’re bursting with peanut butter and chocolatey goodness. All you need is a tall, cold glass of milk for dunkin’! I’m in a funny mood today (pretty much 99% of the time, actully). Guys, I made these Reese’s cookies out of necessity. You see, I do the same thing every year. Eat ALL the candy. Ok, not all, but a good chunk of it. Least there will be some candy left for the kids. Ok, I really have to buy more, but whatever. 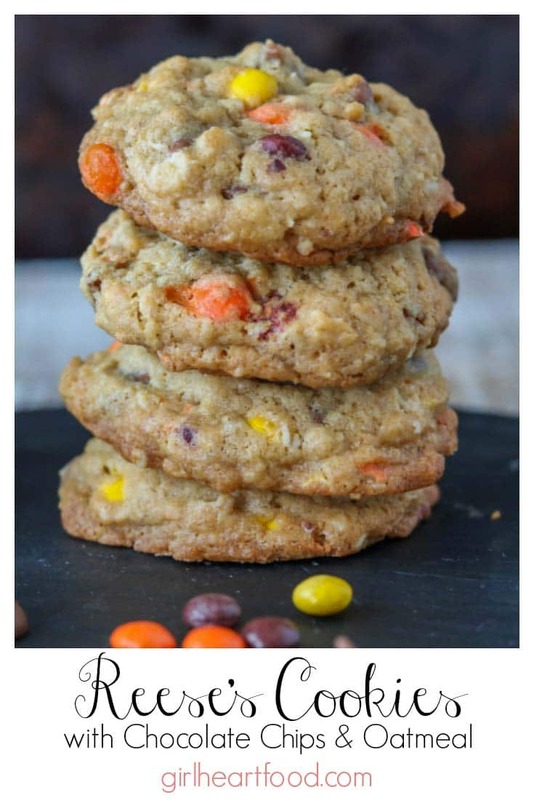 In the event that you do have leftover Halloween candy, these Reese’s cookies would be a great way to use it up! You simply whip up the ingredients in a stand mixer (or in a large bowl using a hand mixer), scoop on a parchment lined baking sheet and bake. The hardest part? Waiting a few minutes for them to cool! 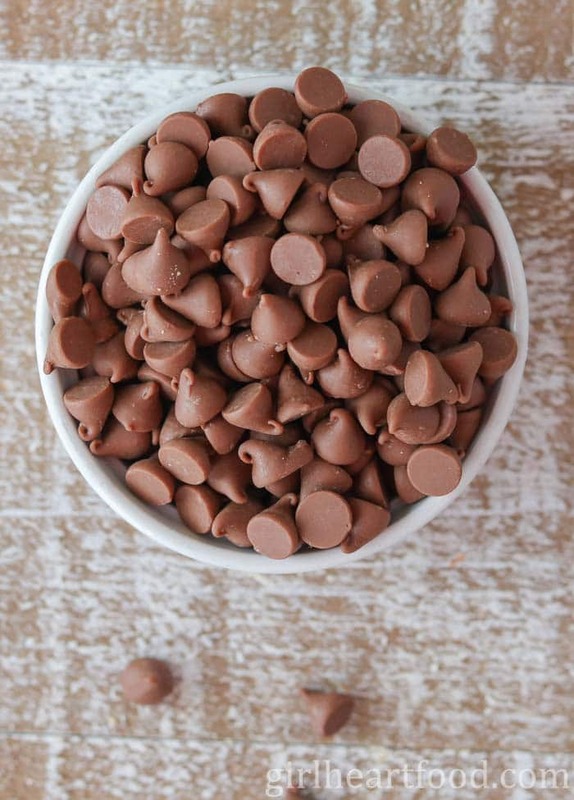 Look at the little things – little bites of heaven…..
Oooooh – and chocolate ain’t so bad either. Then, there’s oats. Just thought I’d throw those in their for the, um, healthy factor. Just roll with it. This Reese’s cookies come together in less than 10 minutes and there’s only about 14 minutes bake time. That’s less than 20 minutes to peanut buttery, chocolate-loaded goodness. Dare I say better than candy bars?? You want a generous scoopful of batter for each cookie, place on a parchment paper lined sheet and bake away. I could tell you in further detail what makes these cookies delicious…. Final (silly) thoughts —> the way I look at it, is that candy and cookies help keep me fit. Without them, would I work out? I think not! So, it’s necessary that I make these cookies. Good argument, huh? Oh, the little lies we tell ourselves, lol. Hope you love these Reese’s cookies as much as I do! These Reese's Cookies with Chocolate Chips and Oatmeal are (almost) too easy to whip up. They're bursting with peanut butter and chocolatey goodness. All you need is a tall, cold glass of milk for dunkin'! Preheat oven to 350 F. In a large bowl combine flour, oats, baking powder and salt. Lay to one side. In a stand mixer (or in a bowl with a hand mixer) combine butter with both sugars. Mix until combined and fluffy (stopping to scrape sides of bowl as necessary), about 2 minutes. Add vanilla extract and mix to combine, about 30 seconds. Add eggs, one at a time, and mix until combined, about 1 minute. Pour reserved flour mixture into butter mixture and blend until combined, 1 - 2 minutes. 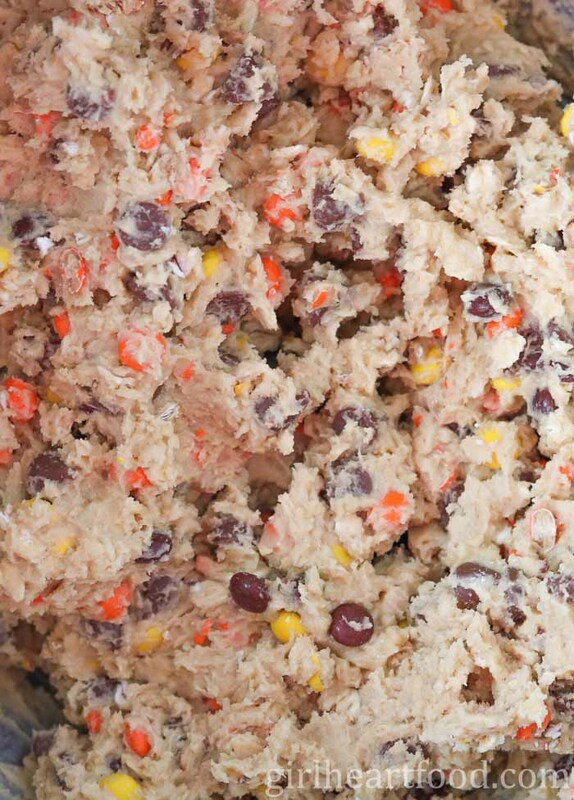 Add candy and chocolate chips and mix about 1 minute. 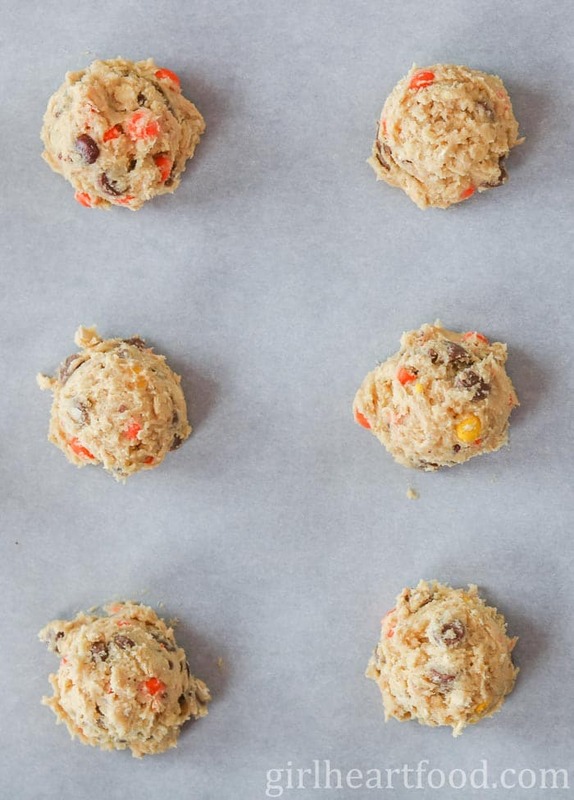 On a parchment lined baking sheet, place about 1 tbsp scoopfuls of cookie dough, about 2 inches apart (you may have to to two batches, depending on the size of your cookie sheet). Bake 12-14 minutes. Carefully remove from oven and cool on cooling rack, about 10 minutes. Enjoy! Lol – Dawn,my daughter and I brought home 2 bags of Reeses and mini kit kats 2 weeks ago to “get ready for Halloween” and I’m not sure where the contents of those bags went off too… 🙂 Now I do need to buy more and make these cookies! Love how THICK they are! YUM! Lol! Story of my life 😉 Thanks Shashi! You’re not the only one, Dawn!!! Haha I try so hard to not buy the candy ahead of time but I always do, and then I can NEVER stop eating it. It’s terrible. 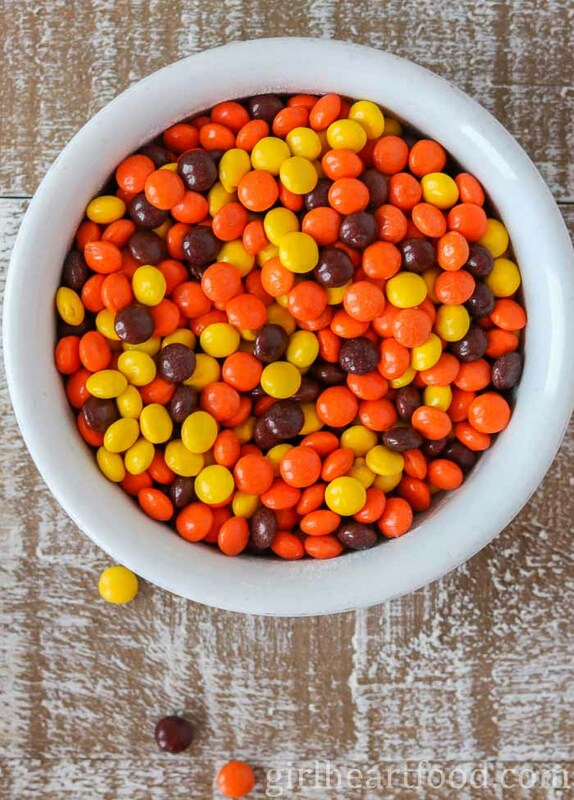 I’m thinking I need to pick out all of the Reese’s Pieces though and make these!!! I love that you used chocolate chips AND the pieces. Yum. I will probably burn my tongue trying one of these before they’re cool enough! Oh dear…you do have a problem! 🙂 Of course, I do the same with coconut, Almond Joy candy bars. It’s a bit of an addiction! I like how you used your obsession by making them into cookies! YES!!! This is another brilliant excuse for eating more candy! Haha – right 😀 ?! Oh, those are delish too! Thanks Kathy! yassss great idea!!!! I don’t think i’ve ever seen mini reeses though! ha ha i’m pretty sure i live under a rock sometimes! What a super fun way to use up Halloween candy, Dawn! So far I’ve been able to leave the bag of candy unopened (from Costco so it’s HUGE). It’s all over if I open it early, lol! Thank you Marissa 🙂 !! Haha – I know, right? No going back then, lol. Dawn – I love your logic about working out – I think I use the same philosophy. Whatever works, right? These cookies look dang good! I’d take them over any candy bar, any day of the year! Thanks for the recipe! Pinning! Hehehe….good one, isn’t it 😉 ?? I think so! Thanks so much, Laura! Happy Monday to ya. Who has any left over Halloween candy?! 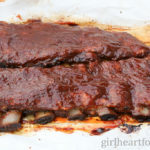 Its usually eaten before the day even comes, but this is a great way to use up what is left! Will be giving this a try! Lol – so true 😉 Thanks Kevin! Hope you love ’em. My boy’s name is Reese and these are so happening next week! I am pretty sure he can handle the recipe himself:) Fun! It’s meant to be :)!! Thanks Milena! Hope you guys love them. OMG I do the same thing every year! I cannot be trusted around candy bars! I even hide them out of sight and then go raid the hiding spot! If they were full size bars I might resist them better. But these little bite sized bars – they seem so harmless. Just a bite, right? Then whole bags are gone! Love, love, love these cookies! Oatmeal gives such a yummy chew. I just want to bite into one of those crispy edges! Right?! So difficult!! And, after all, they are only a small bite like ya said 😉 Thanks so much, Kelly! Lol! You are not alone 🙂 Living in the bush as we do, we don’t even have kids who dare to walk up our spooky, dark lane, so we have NO Halloween visitors. And we still buy Halloween candy 😉 This is such a great way to use some of it! They look delicious! Hahaha – love it!! Just in case, right 😉 ?? Thanks Jennifer! Lol! I do the same thing Dawn! I bet most people do. I’d have a hard time not gobbling up each and every last one of these too. Delicious combo! On my baking list! GIRL! Your intro is the story of my life. This year I made the executive decision not to buy Halloween candy because I have mini candy bars leftover from recipes and I figured I’d just give those away. . .and, even though I avoided eating them all September, now that October is here I keep sneaking a couple a day. It must be something about the time of year that makes us need candy! Or that’s what I’m telling myself. . .Anyway, these cookies look PERFECT! 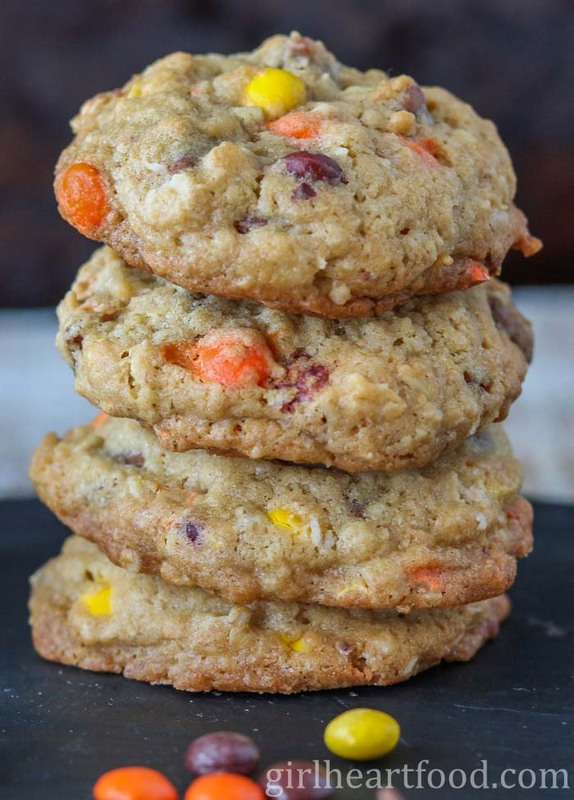 I love oatmeal cookies and the texture on yours looks out of this world! Hahaha! So happy I’m not the only one who gets into the candy early! Oh my! Maybe if we buy flavours that isn’t our fave? Maybe we wouldn’t get into it? Doubtful, lol 😉 Thanks so much, Kelsie! I do the same thing with Halloween candy around here, too, Dawn! I get it early in the month “to get ready for Halloween.” Then I have to go back and buy more later in the month for actual Halloween. Haha! So I must say that oats in cookies is one of my favorite things ever! I know you added them for a “healthy” twist, but that’s what caught my eye first. Well, to be fair, the Reese’s caught my eye about .2 seconds later. Haha! These cookies sound awesome, and I might just need to make a batch here. Yum! Haha – glad to hear I’m not the only one 😉 I definitely think a batch is in order! Hope you love ’em, David! 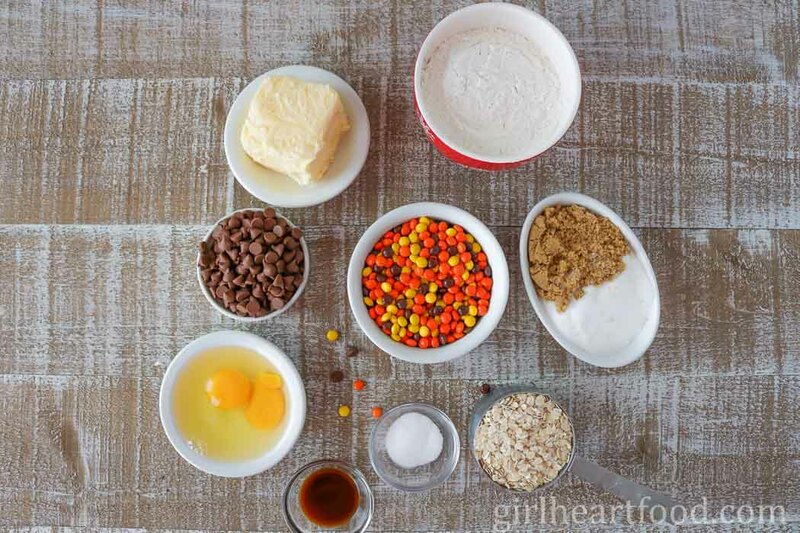 I love baking with reeses pieces! I usually add them as a topping to magic cookie bars, but adding them to oatmeal chocolate chip cookies sounds equally as delicious! And I appreciate the little lie you tell yourself! Sounds like solid logic to me! 😉 Hope your week is off to a great start Dawn! I’m reading this on a Sunday morning and I can’t believe I want cookies now instead of breakfast. It must be the oats. Sure, that’s it. (Leftover Halloween candy is a new concept for me.) I can smell them baking now :). Haha – I think these would be perfectly acceptable for a weekend’s breakfast 😉 Thanks so much, Bill! Hope you’re week is off to a great start!